Though guinea pigs may seem like low-maintenance pets, they require a great deal of forethought and planning before you can successfully incorporate them into your life. If you are considering inviting a new pet guinea pig into your home, it is essential that you have the appropriate supplies to make your new friend comfortable and happy. When you bring your guinea pig home, you'll want to provide him with a secure and roomy place to live. The ASPCA recommends at least 4 square feet of cage space for each guinea pig you have -- the larger the cage, the better. Provide your guinea pig with a solid-bottomed cage with plenty of ventilation. A wire cage with a plastic tub bottom makes an excellent guinea pig abode. Aquariums are not appropriate for guinea pigs because they do not allow for adequate air circulation. Proper bedding is a must for your guinea pig in order to maintain cleanliness. Choose wood shavings from aspens or hardwoods -- never pine or cedar -- grass hay or shredded newspaper. Provide at least 2 inches of bedding for your guinea pig, and ensure that it is free from dust, toxins and sharp objects. Since guinea pigs love to build nests and tunnels, make sure the bedding allows them the freedom to do so. Guinea pigs, like all rodents, have front teeth that are continually growing. To prevent his teeth from getting out of control, your guinea pig must have something to gnaw on in his cage. This can come in the form of wooden toys or blocks that are untreated with chemicals or even twigs from a hardwood tree. In addition to chew toys, you will need to provide your guinea pig with a place to hide when playing and somewhere to sleep in private. You can add in wide PVC pipes -- making sure that your pig won't get stuck -- cardboard tubes, empty coffee cans, a flower pot or a commercially-available sleeping box. Ensure that your guinea pig always has plenty of food and water available to him. A simple inverted water bottle with a metal drinking tube works perfectly as a water source in your guinea pig cage. According to the American Animal Hospital Association, you should also provide him with specially-made guinea pig food pellets that include at least 16 percent crude protein, which are available at pet stores. To supplement the dietary needs of your guinea pig, include some vitamin C in his diet daily. This can come in the form of an orange slice, some fresh kale, strawberries or cabbage. Guinea pigs appreciate the occasional treat of fresh fruits and vegetables in addition to the vitamin C-rich foods above. Also include a small amount of timothy hay in your guinea pig's enclosure; this will promote digestion in addition to giving him something to gnaw. In addition to housing and food supplies, you'll also need a few grooming supplies. Guinea pigs require regular brushing, so you will need a brush or comb specifically for this task. You will also need nail clippers to keep your pig's toenails trimmed, according to the American Animal Hospital Association. 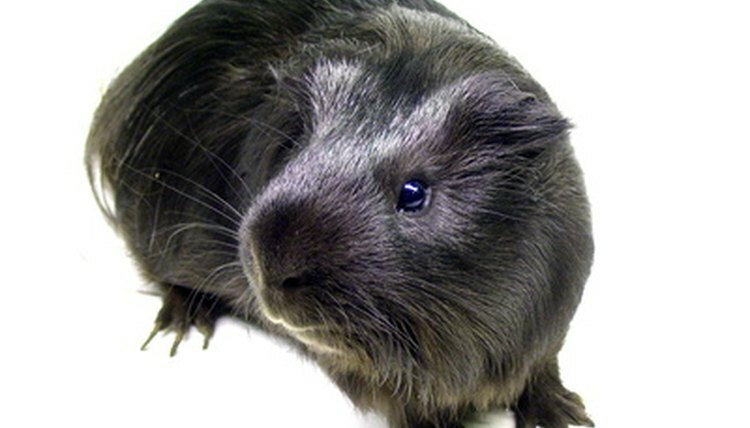 The Humane Society of the United States: Guinea Pigs: The Right Pet for You? What Is Needed for a Pet African Pancake Tortoise? What Woods Are Safe When Building Guinea Pig Houses? What Kinds of Wood Do Rabbits Like to Chew?